Spend the day hurtling down the black hole at 100mph and when you have had enough of all the exhilarating rides grab a beer and chill out with on the grassy area. 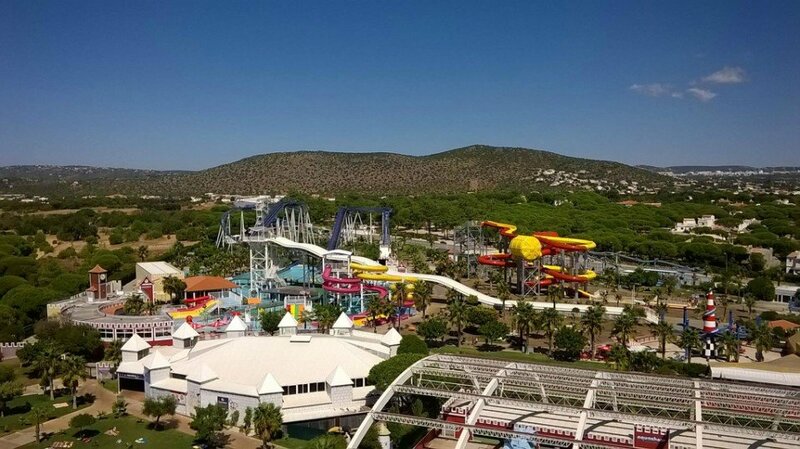 Freefall – You have the choice between two slides of 32 meters Height and 129 meters length each. Slide down the biggest FreeFall of Europe. White Fall – If you like strong emotions and rising adrenaline to the maximum, you can’t miss this crazy fall, where the emotions are on edge. Being the only one of its kind in the world, White Fall will take you to an experience without limits. Wild Snake – This 16 meters tall slide, shaped like a snake will give you a thrill ride in the dark, where the path will become a surprise. Speed Foams – If you like speeding, the Foams are the perfect place to slip away and discover the emotions that await you. Slide with all your energy and show that you are a winner! Wave Pool – The biggest wave pool in Portugal awaits you! You can enjoy a moment of leisure with the whole family and dive into the waves. Aqualand – An awesome space designed for kids, where they will be delighted playing safely and having fun. Tubes – Tubes for everyone! Fast ones, slow ones, it’s your decision! The fast ones for those who love adrenaline and the slow ones for the entire family! Come and find out the emotions of our tubes! Lazy River – The Lazy River will give you a moment of fun and relax, traveling over 250 meters, following the river flow. Twin Space Shuttle – This imposing double slide, with two giant capsules, has 17 meters high and 178m long. Pink & Shark Slide – Have fun with the Pink Slide or challenge the Shark Slide!